One of the things I love about yoga is that literally anything can become a yogic practice so long as you are being mindful of how you feel in the present moment. This means that even when my body is not feeling up to a full yoga practice, even when I am stuck in bed, even when my body is too sore to move, I can tap into that mindfulness and bring my yoga practice off the mat and into my daily life. 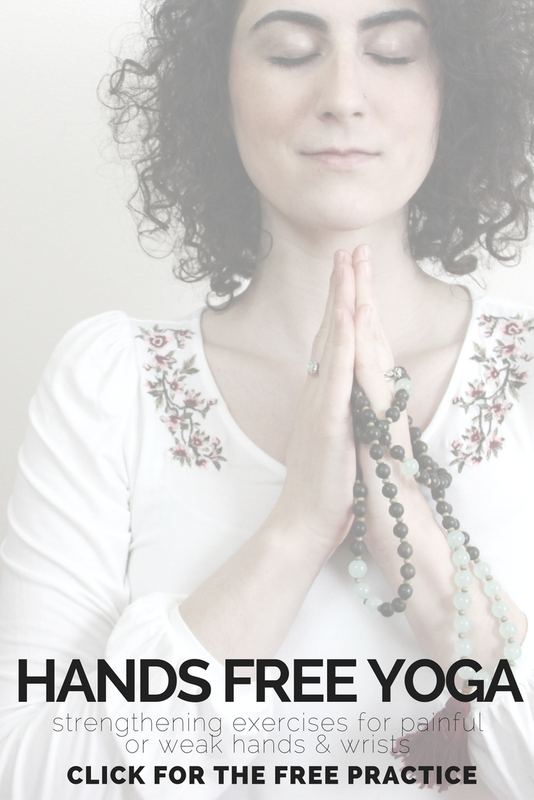 This hands free practice focuses on stretching and strengthening the hands and wrists without bearing any weight on them. These exercises aren’t exactly yoga poses, but we will be infusing them with mindfulness, making this a yogic practice after all. This practice is great for chronic pain, fibromyalgia, arthritis, carpal tunnel, and hypermobility syndromes such as Ehlers-Danlos Syndrome.